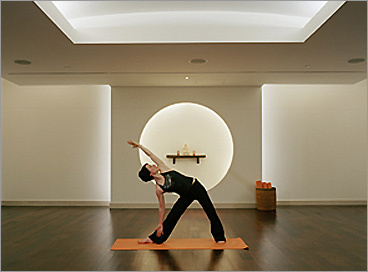 Exhale spa is an oasis of serenity located between the Financial District and the Back Bay in Boston. Once inside its peaceful walls, enter the elevator and transcend to the lower level, where you will experience yoga in one of the most beautiful studios in Boston. Arrive to your class early so you have time to rest on the comfy couches and enjoy a cup of herbal tea. If you only have an hour and want an incredible workout, stop by for an extraordinary Core Fusion class. If you have more time, stay for an entire day of holistic treatments. Exhale Spa, 28 Arlington St., Boston, Mass., 617-532-7000, exhalespa.com. Day spa packages range from $290-$455. Karen McNamee has taught science in the Bahamas and sailing in the Caribbean. She has worked on a number of tall ships and holds a USCG Masters license. She's a community leader for lululemon athletica in Hingham. As a certified Kripalu instructor, she teaches at DragonFly Yoga Studio. She presently lives on the South Shore and loves to travel.